The question came to me via email last Valentine’s Day from our caretaker wife, Paula Scott. Accompanying her email was a photo from one of her trail cams of a large golden eagle. It was sitting on snowy ground beside the carcass of a dead cow on our talus slope. 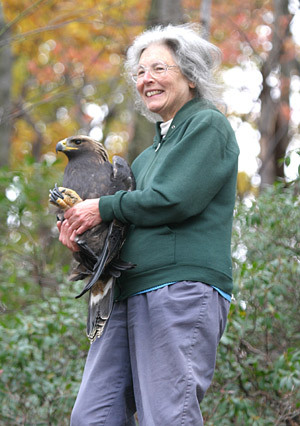 Trish Miller, along with her husband Mike Lanzone, under the direction of Dr. Todd Katzner, at West Virginia University, had recruited numerous state forest employees and private landowners in Pennsylvania to be part of a larger study of winter eastern golden eagles in the Appalachians. Knowing Paula’s expertise with trail cams and also that golden eagles migrate along our ridge top, she had contacted Paula early in the autumn. In her email to Paula and my husband and me as the landowners, Miller explained that this Golden Eagle Project had over 100 trail cam sites in several states but were lacking sites in Pennsylvania. “We simply don’t have enough data on Pennsylvania wintering birds and it is especially important given your proximity to Sandy Ridge,” she wrote. By Sandy Ridge she meant the section of the Allegheny Front across from our mountain and above the town of Tyrone where a couple dozen industrial wind mills had been erected despite Miller’s discovery, while studying for her Ph.D., that golden eagles use that area for foraging during the winter. When Paula agreed to participate, Miller sent her a copy of the protocol for the study which she shared with me. The goal of the project was to estimate the population size of wintering golden eagles in the Appalachians. To accomplish this goal, they wanted many photographs of individual golden eagles. Then they planned to use a specially designed software package to identify individuals. Once they had identified individual eagles, they could treat the photographs as “captures’ and use them to estimate golden eagle numbers. Trail cameras had to be set to take a picture every minute and visited every two to five days. They also had to be on a stake or small tree six feet from the carcass and the lens itself 18 to 24 inches above the ground. The study was scheduled for two to four weeks between January 1 and February 15. Bait sites needed to be on remote mountaintop areas with small clearings and large trees nearby so that an eagle could perch in one and watch the bait for a time before actually landing on it. The protocol also suggested that the carcasses be road-killed deer for which the biologists had permits from the Game Commission. Several weeks later, Miller came out to look at possible trail cam sites. She finally decided on a site behind our spruce grove and another at our Far Field. She also hoped, if a golden eagle came to the spruce grove bait area, to set up a blind and try to live trap and telemeter it so the biologists could find out where the individual nested. The protocol warned participants to make sure they had enough bait to feed eagles because a small deer could disappear in a day. Knowing how many other creatures would use the bait, Troy and Paula decided to ask their farmer friends in the nearby valleys for cows that had died giving birth. As long as those cows had no antibiotics in their bodies and their heads were removed where the farmers had shot them, they received permission to use them as well as road-killed deer and, in one case, a dead calf. On the seventh of January, Troy, Paula, and our son Dave drove a 700lb. 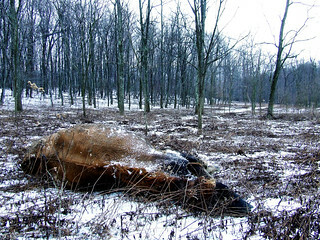 dead cow in the back of their truck to the Far Field, staked it down, and set up a camera. That same day they took two deer and a dead calf, chained them together, and staked them down 40 feet into the top of First Field behind the spruce grove. And then they waited. Paula faithfully checked her cameras and sent photos to me of a barred and great horned owl, crows, a bobcat, coyotes, a fisher, a red-tailed hawk, and raccoons at the bait both night and day but no golden eagles. As the weeks passed, she grew more and more frustrated. Finally, on the seventh of February, she persuaded Troy to haul another dead cow up to the talus slope where, several years earlier, Miller had live-trapped a female golden eagle during fall migration. The rocks were icy, and they almost lost the frozen carcass off the deer sled on the steep hill. Paula was elated when she retrieved her photos and saw the talus slope golden eagle. But then she went up after 2:00 p.m. on Valentine’s Day to retrieve the most recent spruce grove photos. A big bird took off as she emerged from the spruces and approached the carcass. 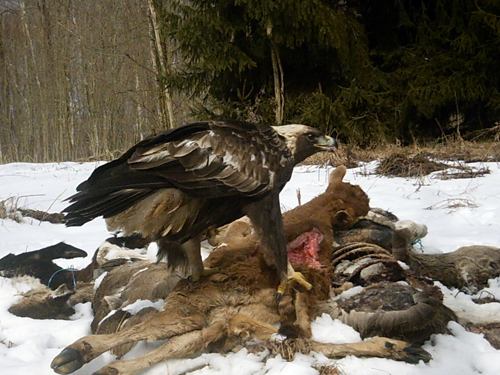 It was a golden eagle that had been on the bait from 12:00 p.m. until 2:00 when she disturbed it. The photos were much better than the one from the talus slope, and we wondered if it was the same bird. Even though the official study ended the next day, Paula decided to keep all the carcasses out with her cameras as long as possible. She also notified Miller, but she was unable to come and try to live trap the eagle until the following week. Would the eagle stay around that long? On February 18 there were 198 more golden eagle photos on the spruce grove camera, but the last photos had been taken on February 17 and there were no more. A week later, on February 27, I saw a large bird flap off the Far Field bait. I thought it was a golden eagle, and Paula later verified that it was and that it had been coming into the bait for four days. My last sighting of a golden eagle there was March 2, but by then golden eagle migration was in full swing. 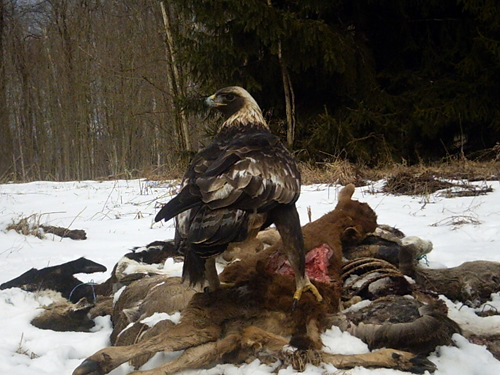 In fact, because it was such a warm winter, our golden eagles may have all been migrants and not wintering birds. In the meantime, Miller and Lanzone had been rushing all over the state telemetering birds at other bait sites. They managed to capture three males and three females. In Forbes State Forest, with the help of state forester Cory Wentzel, they captured the largest known bird in eastern North America, a second winter female and the only young bird they caught. The other five were adults, one each in Tuscarora and Rothrock state forests, the Allegheny National Forest, and two private sites near Emporium. The male they caught in Rothrock was a recovery that had been originally caught in 2000 by other researchers as a first year bird during fall migration. Miller and Katzner also exchange information with colleagues in Quebec province where most of our golden eagles go to nest. Most of the birds they telemetered in 2012 headed straight north toward northern Quebec and Labrador, one adult female took a trip around Quebec’s more southerly Gaspe Peninsula, and one male ended up on the south shore of the Hudson Bay in Ontario after a look around Manitoba. He was the first bird in their project to go west to the Ontario breeding range. In a recent paper published by members of the recently-formed Eastern Golden Eagle Working Group, the researchers have discovered that Quebec has the largest number of breeding eastern golden eagles at 300 to 500 breeding pairs, most of which nest above 50 degrees North. Those nests in the far north of Quebec are built on cliffs, on the edge of but avoiding heavily forested areas. Those on the Gaspe are mostly in trees in forested habitats. However, golden eagles on the Gaspe do forage in open landscapes created by disturbances and wetlands and feed extensively on birds, particularly waterfowl and wading birds. Birds that summer on the Gaspe mainly migrate through New England, which, before the age of DDT, also had a breeding population as did New York. Those individuals winter mainly in New York and Pennsylvania and may not be counted at raptor migration watching sites farther south. Apparently, eastern golden eagles begin migrating as early as mid-August, although most migrate from mid-October to mid-December. So far, their telemetry and camera-trapping data suggest that golden eagles winter in greatest numbers in the north-central Appalachian Mountains of Pennsylvania, West Virginia, and Virginia, and on those mountains they use large blocks of forested habitat. They feed on carrion, most notably white-tailed deer. Eastern golden eagles face threats throughout their lives from a variety of sources. 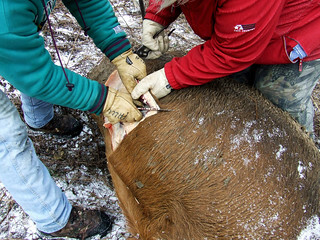 One is incidental captures in leg-hold traps and snares set for mammals, for instance, from 2007 to 2010 Quebec, West Virginia and Virginia reported many incidental captures and Quebec researchers suspected that many more were not reported. Shootings, accidental or intentional, collisions with towers, power lines, buildings, and now probably with the array of industrial wind farms on their migrating mountaintop routes and in their breeding and wintering ranges, as well as poisoning are also common. Habitat loss—especially on their migration, wintering, and southern Gaspe breeding grounds—because of wind energy and natural gas extraction—is another threat, although the province of Quebec has recently banned natural gas drilling. Still, we saw numerous industrial wind farms on top of the high, rugged mountains on the Gaspe along the St. Lawrence River. And more and more such facilities have been and are continuing to be built on mountaintops in Pennsylvania, West Virginia, and Virginia. Here are some more photos of other wildlife at the spruce grove bait pile (click the thumbnails for larger versions). Thanks to Paula Scott for all the great trail cam photos!